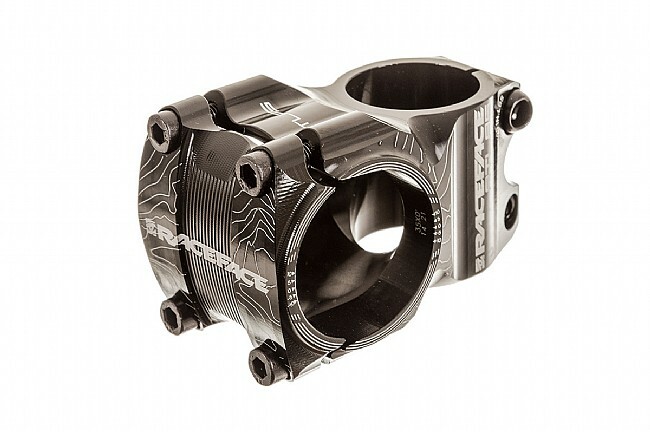 Move up to a stiffer and lighter cockpit with the Race Face Atlas 35 MTB Stem. With its 35mm clamp size, this stem is integral for a move to this new bar standard that is gaining traction in the mountain bike world. When used in conjunction with a 35mm handlebar it results in a lower total weight to a comparable 31.8mm setup and with an increase in stiffness. This stem lives up to the Atlas name with DH/FR ready strength, a four bolt faceplate for secure clamping without stress risers, and opposing bolts on the steerer tube clamp to increase clamping power while decreasing stress. Laser etched logos and contour map design also seamlessly matches other Atlas parts from Race Face. 35.0 mm clamp diameter. Claimed weight is 141 g.